I was lucky; I hear a lot of parents complaining about their lawyers. So I talked with Elizabeth Fassler, a lawyer at the Center for Family Representation (CFR), to find out what a lawyer’s role should be. Q: How does a parent get a lawyer? A: In general, if a parent is accused of abuse or neglect there’s a court case in Family Court. The Family Court judge will assign a lawyer. However, there are also lawyers who work for organizations like Bronx Defenders, Legal Services, or The Door, which works with young mothers and teens. CFR, where I work, assigns a lawyer, social worker and parent advocate to every case so parents have more support. There is no reason to accept assigned counsel if you can get a lawyer through one of these organizations, even though some court-assigned lawyers are very good at what they do. You should contact these organizations to see if you fit their criteria. Call as soon as possible. Don’t wait for your first court date. 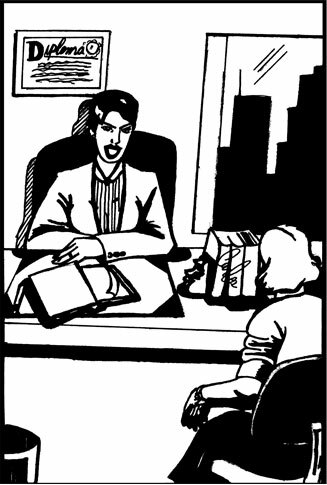 Q: How does a parent know whether the lawyer is doing a good job? A: That’s a hard question to answer. Every case is different. But the important thing is communication. Your lawyer should talk to you about your case before your court date, not just on the day of court. Your lawyer should advocate for your wishes in court. That might mean making motions to get information from ACS, helping negotiate with ACS what kinds of services you need, or asking the court to have the children returned to you. If your lawyer isn’t communicating with you, and you think it’s hurting your case, you can fire your lawyer and ask for a new lawyer. However it’s not always easy or even possible to get a new lawyer and may slow your case down. Q: What do parents need to know about their lawyers? A: The best lawyers are the most informed. Keep all your documents in one place and bring copies of all documents with you when you see your lawyer, like school reports, birth certificates, records of drug treatment or mental health treatment, and any other services. The more you can be an advocate for yourself, the better. If a couple is trying to get a child home from foster care, each person may have their own lawyer. That’s because parents have different interests, and the lawyer’s job is to advocate only for her client. You should also know that a lawyer can’t fix the problems of family court. Sometimes you get into court and one lawyer is not there and the case gets adjourned for a couple of months. That’s very frustrating for parents, especially if they took the day off work. But it’s not the lawyer’s fault a case gets adjourned. At those times, there’s not a lot your lawyer can do, but a lawyer can ask for the next court date to be sooner, or if there’s something in particular that a client needs, the lawyer can file a motion. Finally, I think it’s hard for parents when they see their lawyer and the ACS or agency lawyers talking to each other in the hall or joking outside of court. They might think, “How are they going to be my lawyer if they’re friends with them?” But the reality is that communication between lawyers is key in family court. Your lawyer should be talking to ACS and your child’s law guardian about your case, because the more information everyone has, the easier it is to make informed decisions about the case. We maintain a cordial atmosphere with other lawyers not to conspire against you, but because we see these people every day and the relationship we’ve fostered helps us do our jobs. Q: What advice do you give your clients? A: I always tell clients, “If you’re on the witness stand, answer only the question asked.” People always want to tell their stories, but giving too much information might not be a good thing. You also need to realize that your child’s law guardian or the ACS attorney may seem really nice, but if you tell them anything about you, it is not confidential and it will be presented to the court. The only confidential relationship you have is with your lawyer. In court, think about the information you’re sharing, the way you’re sharing it, and the behavior you’re exhibiting every time you talk to someone other than your lawyer. If you don’t want them to know, don’t tell. You can reach CFR at (212) 691-0950.